It's amazing how you can find yourself drawn to design aspects that you never thought that you would be interested in, don't you think? Today's 'Home Improvement' post is not necessarily one that I would really decorate my home with (see: cow tile work), but I certainly think that the image above is inspiring. Green is one of those colors that I think is so often overlooked when it comes to home interiors, and yet, it is one of those colors that pretty much have whichever impact you want it to. Pale greens can be calming and quite pretty, while emeralds and kelly greens are much bolder and make a stronger statement. 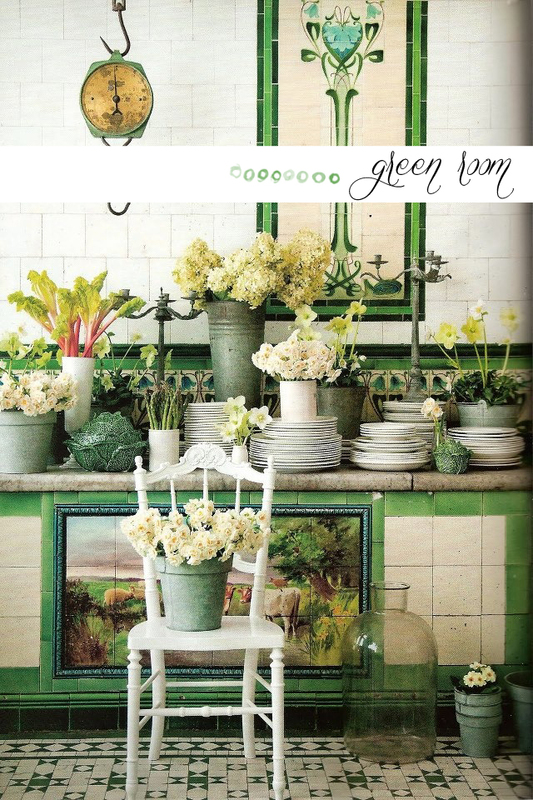 I find the idea of a green kitchen interesting, in that green is often associated with a state of calmness. In the kitchen, cooking and being with family and friends, should not be a stressful activity. Who knows? By incorporating more greens in the kitchen, and not just on our plates, our general stress levels may even lower. All of the flowers don't hurt, either. What do you think of green interiors? What about green kitchens? Check out this green formal room that I would love to daydream in, as well.